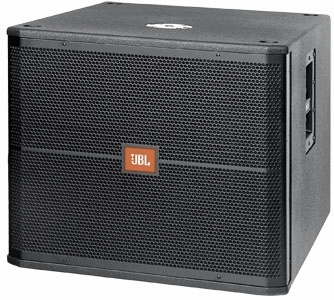 JBL SRX718S Series Loudspeaker DJParts - All Variety of Parts that DJ Needs. The SRX718S subwoofer's compact design is equally at home as a small, high-performance satellite subwoofer system or as a building block for larger subwoofer arrays. The 13-ply birch enclosure is rigidly braced for solid response. A top-mounted, M20 threaded pole receptacle is used to ensure that even heavier, high-power satellite speakers can be securely mounted using the optional, adjustable SS4-BK speaker pole. Threaded insert points are provided for attachment of the optional WK-4 wheel kit.